Would you like to burn enough calories to lose weight, get in shape and earn that holiday turkey? Would you like to try something that’s so much fun it doesn’t seem like exercise? Then try hooping! 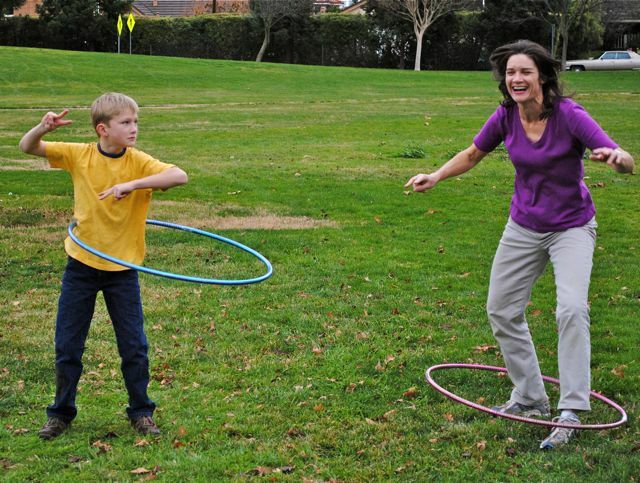 That’s right, hooping (as in hula) for adults. A few years ago, Santa Claus brought my kids two hoops (they don’t call them “hula-hoops” anymore). We went out to the park to try them. Of course the kids figured it out right away. I had more trouble. 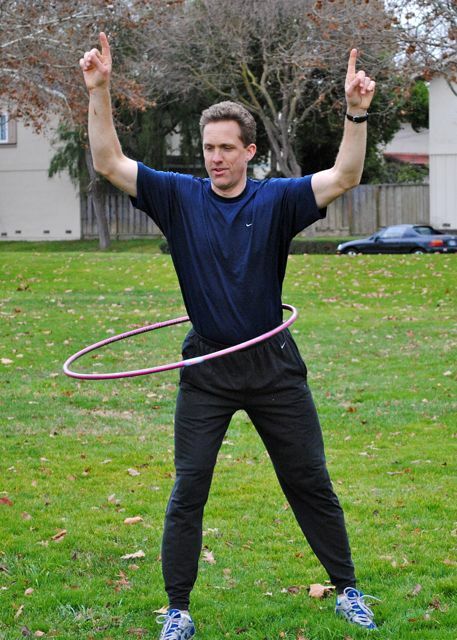 I’d never been successful at hooping as a child but I was determined to learn it as an adult. I’d read that the secret to keeping the hoop up, was to put one foot in front of the other and slightly rock forward and backward, not side to side. Guess what – it worked! I was pretty bad at first, but the great thing about hooping is it makes you laugh. If you drop it, just pick it up and try again. Eventually you’ll get it. Notice how “cool” my son is and how klutzy I am! A few days later I discovered they make adult sized hoops. In fact, there are a lot to choose from. The best ones weigh about 1.5 to 2 lbs. You don’t want anything heavier as it could strain your back. Besides, you don’t need it. It’s the amount you move, not the weight of the hoop, that will burn calories. I bought my favorite hoop from Big 5. It’s a big, green, plastic 1.5 lb hoop. You can buy hoops in most sporting good stores and on-line. You can also buy books that teach different hooping moves. 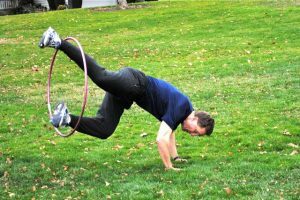 My favorite one is called, “Hooping: A Revolutionary Fitness Program,” by Christabel Zamor There’s also a DVD by actress Marisa Tomei called, “Hoopbody.” There are many choices; YouTube has lots of teaching movies as well. One thing I wouldn’t recommend is to hoop while watching TV. That’s hooping in place; it’s boring and doesn’t burn many calories. You’ve got to put your heart into it! Turn on the music and dance! Once you learn the basics, and it won’t take long if you keep at it, you’ll feel free to really move. It didn’t take me long to go down two pant sizes. 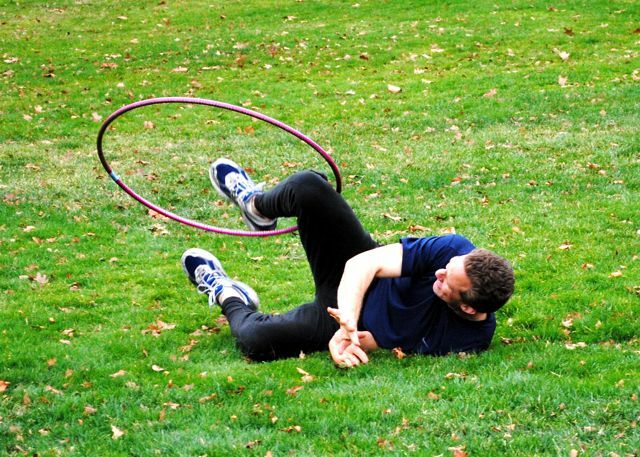 One study showed that a person could burn up to 210 calories in a half hour class (“Hula Hoop Workouts Burn Calories,” on webmd.com). 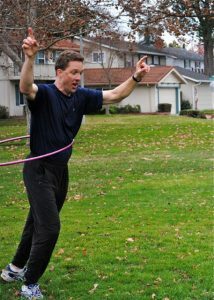 Provided you don’t have any physical limitations (see your physician if you’re not sure), anyone can hoop. Young, old, in-shape, out-of-shape, graceful, non-graceful (that would be me). Men like hooping too! Hooping For The First Time – Success! So get out there and hoop! Take a hooping class or join a group, hoop in private or in public, but above all – enjoy yourself! Why should kids have all the fun? 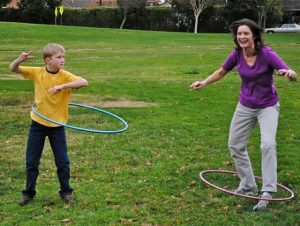 Does anyone have any hooping stories to share?